Rosemary is my Sunday name and the one I use for business, but everyone else calls me Rosie. I think of myself as free range as well as freelance – able to jump up at a moment’s notice to do whatever. My German pal once asked if I enjoyed being an ‘illustrationist’ and it conjured up images to me of an illustration illusionist. The two together make me feel like I fit in a very specific niche! Age: I am 30. I was a surprise mid-‘80s baby! Provenance: I was born to an English mother and Scottish father in Carlisle, which is a small city right below the English border with Scotland. That makes me feel borderline Scottish/English – or Sconglish? It’s one of those places people pass through on the train, but it has all the good English city trimmings: castle, cathedral, guildhall, town cross and museum. How long have you lived in Glasgow? I’ve been coming to Glasgow since I can remember; it’s where my dad’s family is from and where he was born. My Gran still lives here; she’s 94 and still full of it. I came here to study at the Glasgow School of Art, 12 years ago, and never left. Occupations: After I finished my design degree, I wanted to leave design behind and just do crafts. It was something I needed to get out of my system. I mucked about with crafts for a couple of years and then I moved to China for a little while to try a new way of life. It didn’t really work for me so I returned to Glasgow. She welcomed me back and I printed some business cards with my name and the title ‘illustrator’ on them. Illustration lets me do anything I want so long as I end up with an image at the end for murals, books, website stuff, postcards, tea towels and more. Recently I became involved with work that also features literature, stories and heritage. Community involvement with my work makes me very fulfilled; I’m in my element if I can collaborate. Passions and Interests: I like talking. I think because I work on my own a lot of the time, I save up all that chat for the next lucky person I see. I worked on a project last summer, The Glasgow Alphabet Map, which involved drawing a map of Glasgow and then interviewing 26 people: one for each letter of the alphabet. I used their stories to help me draw the map and to populate the back of the printed version. Using stories and words as part of illustration really gets me going. If someone is excited about something, generally I am too. There was a time when I would deliberately sit next to lone people on trains and strike up conversations to amuse myself and maybe learn something. Sometimes it backfires so I don’t do it much anymore! Aside from illustration, I love seeing art, films, animation, talking and eating. Cycling is a pretty great thing to do too, it gets me from A to B without a lot of hassle and I see a lot on my journeys. I love exploring but haven’t had the chance to travel much apart from a great project up in Shetland last November. I designed the ‘High Standards of Shetland Library’ which was a series of illustrated flags and a handmade wooden pole. Everyone made me so welcome, the landscape is so amazing and people embraced the artwork so completely that it was just a wonderful, inspiring journey. It made me want to see more of Scotland. And… I love bees. I just think they’re the best. What do people know you for? Someone once described me as a professional enthusiast, so I suppose I’m best at being engaged with whatever is going on and the chat is part of that. I find that not many people get the big picture of what I do; most imagine I just do the one thing; either murals, city alphabets or maps. I think it’s difficult to communicate a complex job like a freelance illustrator without lots of explanation. Sometimes if I tell someone I’m an illustrator, they automatically assume I’m famous and they’ll have seen my work. I always have to disappoint them! Thoughts on Glasgow? It’s my home. Glasgow is where I have become my current self. It’s small enough that I can bump into people I know, but big enough so that I feel there’s always something I’m missing. The friendly atmosphere, free museums, parks and arts scene just make it an excellent place to be. I also think it has a bit of an edge. Often people have preconceptions of Glasgow being very rough and scary, but it’s not really. It’s a very welcoming city and there’s a sense of community that I think some cities lack. I live between two Glasgow architectural icons: the Glasgow School of Art, which is considered the masterpiece of the architect Charles Rennie Mackintosh, and the Glasgow Film Theatre, GFT. I went to the art school and still live two minutes away, and the GFT is where my Gran and Grandad had their first date to see the film The Seventh Veil in the mid 1940s. It feels like I’m getting an architectural, cultural and historical hug when I walk into or past these buildings. Glasgow does have the rain and famously bad weather, but when it’s sunny, we have the greenest grass and the most beautiful views. It has pockets of architecture that are world class, a dark, sick sense of humour and a stoical nature. Glasgow is not a ‘giving up’ sort of city. Its name means ‘dear green place’ and I think that’s how I feel about it. I first heard about Rosie through her project The Glasgow Alphabet Map, which I thought was a very clever idea. I went to see the exhibition of the Glasgow Alphabet at the gallery at The Lighthouse. I too have a love of people, community projects, illustration and stories. 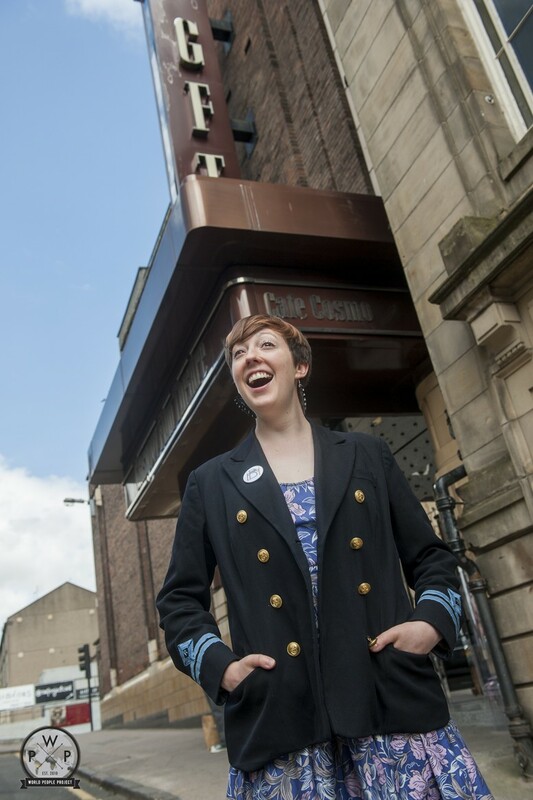 I photographed Rosie outside the Glasgow Film Theatre in Glasgow.